Hi there! Hannah, from Fanciful Spaces here! Halloween is ALMOST here, and if you’re looking for last minute card crafting inspiration I’ve got you covered! 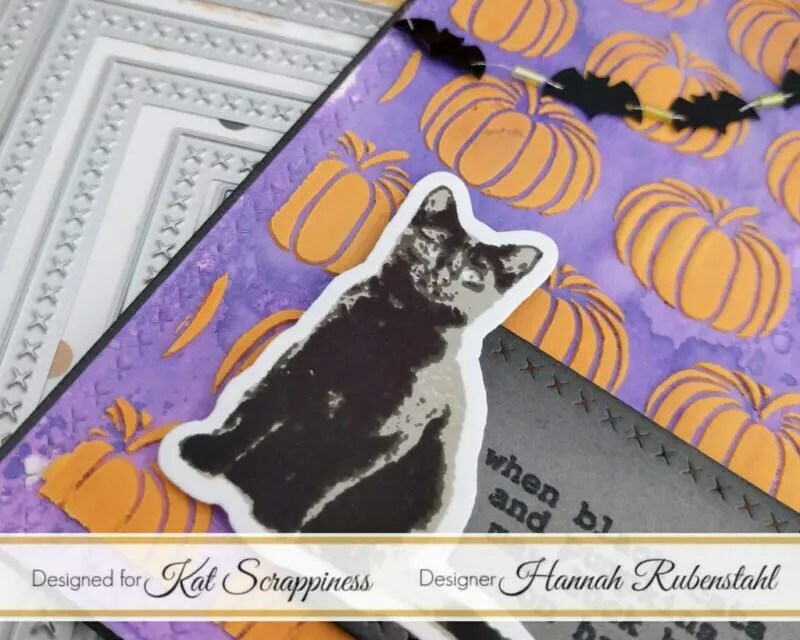 There is STILL time to order your Halloween crafting supplies from Kat Scrappiness, Kathleen is SO quick with her turn around that you don’t need to fret! The last time I posted I was sharing a card I made using the new Toil & Trouble stamp and die set, which is exclusive to Kat Scrappiness. You can see the card I made here. I’m using the same set today! But it has a very different feel, and instead of using the skull, I am using the cat! There are so many great sentiments in this set that I didn’t have to look far for the perfect one, and for the perfect inspiration. I loved the sentiment about the black cat and the pumpkins. I also loved a piece of cardstock that I had made some time ago when I was playing with Distress Oxides. I took that piece, and die cut it using one of Kat’s new Cross Stitched Rectangle Dies. This die is a touch smaller than 4.25×5.5 (an A2 sized card) which means it is the perfect size to mat it onto something. It also allowed me to easily, and neatly mask off the cross stitched section, I used painter’s tape along the edge of the line created by the die cut. I knew I was going to be using texture paste and I didn’t want any on my cross stitching. Isn’t the background just YUMMY! Using the Pumpkin Stencil from Echo Park, some Ranger Texture Paste, and a mixture of Nuvo Drop fluid and more Distress Oxide, I was able to create a yummy orange pumpkin backdrop! Next, I stamped out the cat from the Toil & Trouble set, I played around with a variety of grays and blacks that I had in my stash. I also used the tiny cat eye stamp to heat emboss (using Versamark Clear Embossing Ink) some WOW! Glow in the Dark Embossing Powder. It was then die cut out using the accompanying die. I stamped my chosen sentiment onto some grey cardstock using Memento Tuxedo Black Ink. I used the same embossing ink to then heat emboss WOW! Clear Embossing Powder over the sentiment. 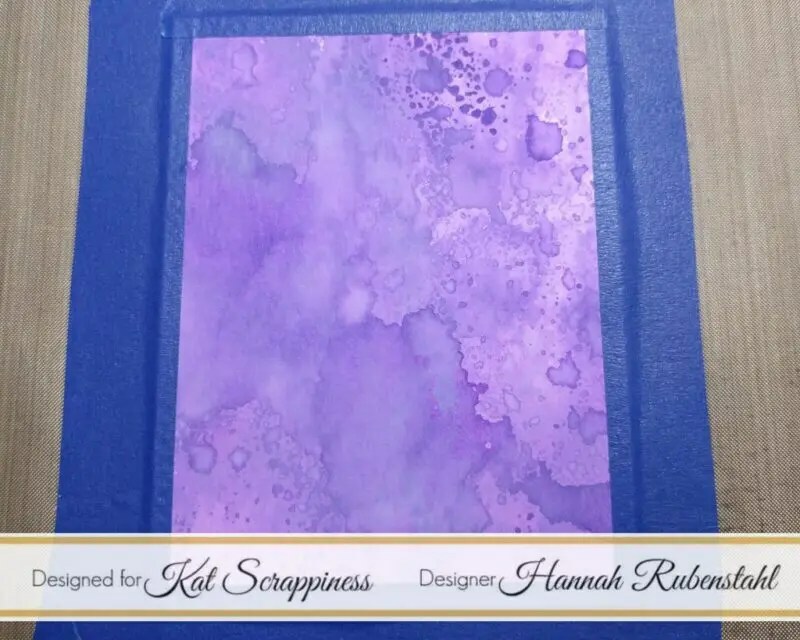 The Tim Holtz Stamping Platform made this so easy and gave me such a perfect impression at the same place multiple times! Finally, I die cut this grey cardstock using the smallest of the Cross Stitched Rectangle Dies and then dusted some Memento Tuxedo Black ink along the edges. 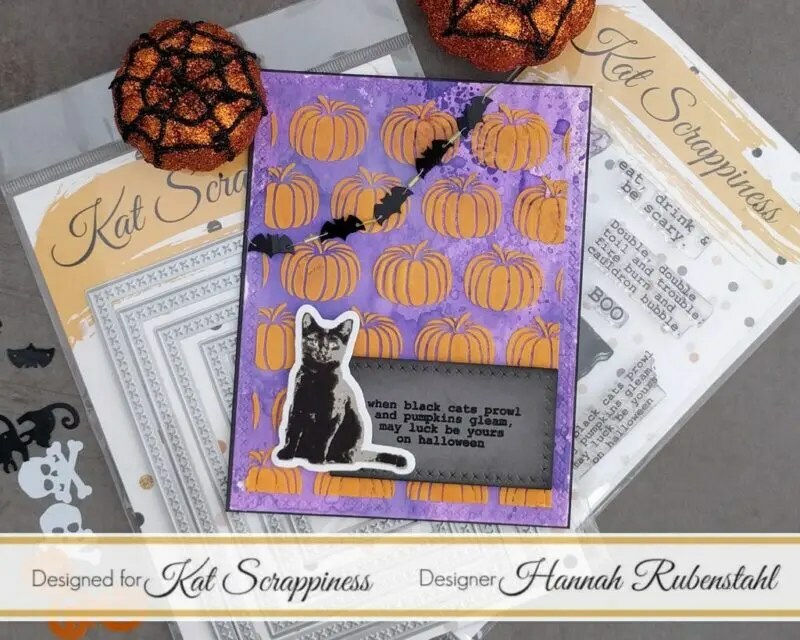 Using both the Kat Scrappiness Halloween Icon and Kat Scrappiness Spring Leaves sequin mixes I then strung a garland of alternating bats and leaves on a thin piece of silver embroidery floss. I taped this to the backside of my pumpkin panel. I cut out an A2 sized piece of cardstock from the same gray used for the sentiment panel and also dusted the edges of it with Memento Tuxedo Black Ink and taped my pumpkin panel to it. Using a small piece of fun foam I popped my sentiment off of the pumpkin panel and did the same for the cat. Where the cat overlapped the panel I used Ranger Multi-Medium Matt. And there we go! A fun and a festive card that anyone can enjoy! I hope you are inspired to create your own work of art! 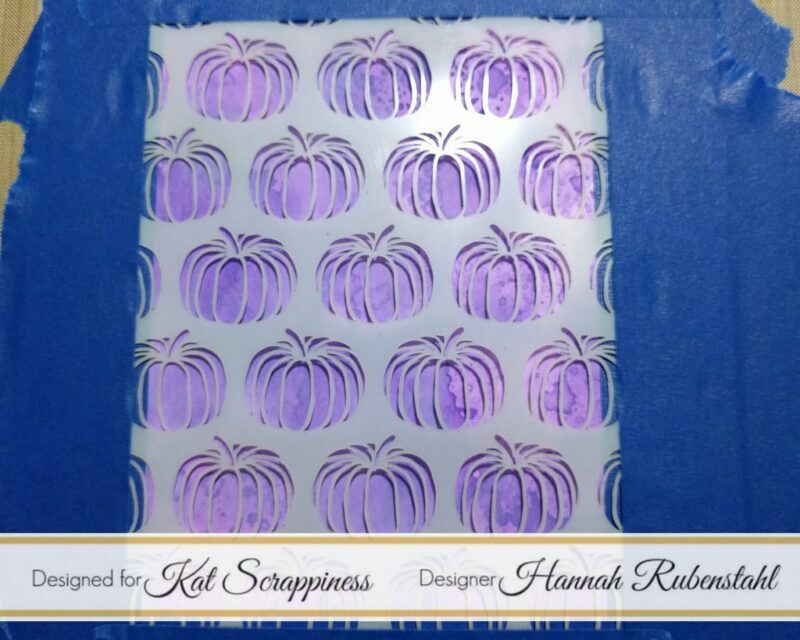 If you like, you can use my discount code at Kat Scrappiness which is Hannah10! That’s such a cool Halloween card ! !